AVIGNON, FRANCE - On a sunny, warm Tuesday afternoon, Viking Cruises christened seven of its new design river ships, three of which were docked side by side in the town and four of which were still in the shipyard in Rostock, Germany. It was all part of a mass-christening event for 18 ships that's taking place over three different days this week. Indeed, Viking seems determined to keep breaking its own records. 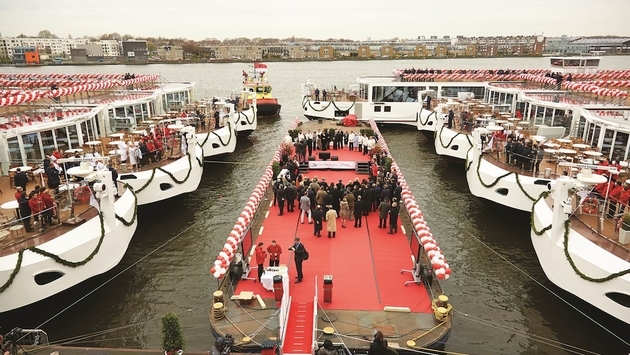 Two years ago it christened four new Viking Longships, then a revolutionary design for European river ships, in Amsterdam. 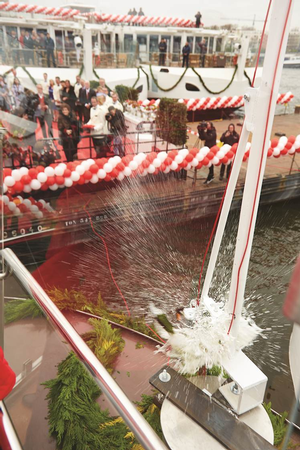 Last March, the company christened 10 new Longships, again in Amsterdam. But this year Viking is christening 16 new Longships as well as two other ships in ceremonies taking place March 17 in Amsterdam, March 18 in Avignon and Rostock, and on March 21 in Porto, Portugal. 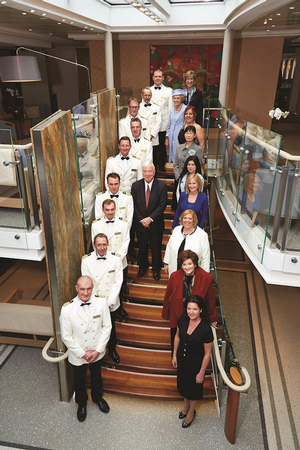 That means Viking now has 30 new Longships, each with a capacity of 190 passengers, in the European river cruise market and a total fleet of roughly 50 ships worldwide. 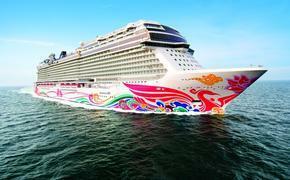 The line's new ships are all named after gods or figures in Norse or Danish mythology. 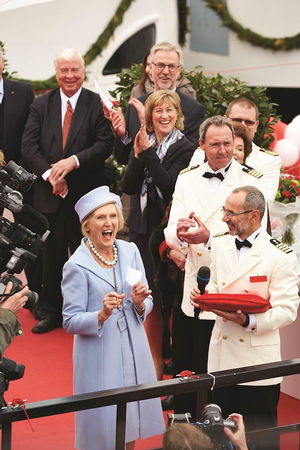 For Tor Hagen, chairman of Viking, and of Norwegian and Viking descent himself, this latest christening represents a huge bet that river cruising will continue its exponential growth in the years to come. 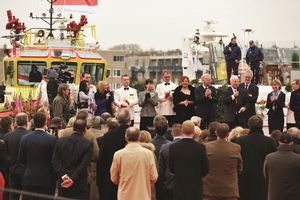 This year's christening festivities kicked off on March 17 with the naming of nine new Longships in Amsterdam. Those vessels included Viking Alsvin, Viking Baldur, Viking Bestla, Viking Delling, Viking Eistla, Viking Gullveig, Viking Ingvi, Viking Lif, Viking Magni. Viking continued the streak on March 18 with the christening of Viking Buri, Viking Hermod and Viking Heimdal. Simultaneously the company christened the Viking Hlin, Viking Idi, Viking Kara and Viking Kvasir in Rostock, which is where Viking is building its Longship fleet. Then on March 21 Viking will christen the Viking Torgil and Viking Hemming in Porto, Portugal, though those ships are of a different design for the Douro River on which they will sail. Viking's new ships will offer sailings on such rivers as the Rhine; Maine and Moselle; Danube; Elbe; Dordogne, Garonne and Gironde; Rhone and Saone; Seine; waterways of Holland and Belgium; and Douro. With 18 new ships, of course, come 18 new godmothers. Most of these were picked from the travel trade from the top selling travel agency groups, or from the banking industry, including Viking's lending bank UBS. Others represented the entertaining or culinary arts and even the political world. Each godmother in turn stepped up to the microphone to bless her respective ship and then pushed a red button that released the traditional bottle of champagne against the ship's side. Susie Barrie, godmother of Viking Heimdal, is an award-winning author, broadcaster and wine personality know for BBC1's "Saturday Kitchen." Mary Berry, godmother of Viking Alsvin, is another cooking expert, specializing in Aga cookery, with more than 40 best-selling cookbooks. Laura Ferreira, godmother of Viking Hemming, is the wife of the prime minister of Portugal, who focus on geriatrics and working with the elderly. Vicky Garcia, godmother of Viking Magni, is chief operating officer and co-owner of Cruise Planners-American Express Travel. Hanh Haley, godmother of Viking Gullveig, works in private aviation as an independent contractor, and also happens to be the partner of Michael Batt, chairman of Travel Leaders Group. Sarah Henshall, godmother of Viking Lif, is vice president of travel any branch operations at AAA Carolinas; Marion Krase, godmother of Viking Hlin, is a senior employee in the repair and new building department at Neptun Werft shipyard, where the Viking Longships are built. Mireille Mathieu, godmother of Viking Buri, is a famed French singer from Avignon who has sold 130 million albums and sung 1,200 songs in nine languages. Kathryn Mazza-Burney, godmother of Viking Baldur, is executive vice president at TravelSavers. Ana Moura, godmother of Viking Torgil, is one of the most popular faddists (singers of fado) in Portugal. Regula Oderbolz, godmother of Viking Idi, is manager director of UBS AG, the Swiss bank. Monica Petitpierre, godmother of Viking Kvasir, is a famed art gallery owner in Sao Paulo's Pinheiros district, whose husband works with several river cruise companies. Laura Pfleumer, godmother of Viking Kara, is responsible for the daily banking business for Viking Cruises at UBS AG, the Swiss bank. Geraldine Ree, godmother of Viking Eistla, is senior vice president of sales and marketing at Expedia CruiseShipCenters. Anne Morgan Scully, godmother of Viking Ingvi, is president of McCabe World Travel. Ayako Ward, godmother of Viking Delling, is a noted food and cruise travel writer, who lives with her husband Douglas Ward, author of Berlitz Cruising and Cruise Ships and the Berlitz European River Cruising guidebooks. Anne Willan, godmother of Viking Hermod, is one of the world's authorities on French cooking, who founded Ecole de Cuisine La Varenne in Paris and authored a number of leading cookbooks. Pam Young, godmother of Viking Bestla, is vice president of industry relations for Travel Leaders Franchise Group.